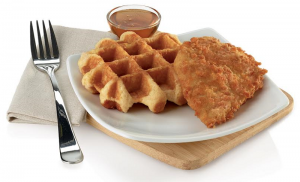 Last week, Chick-fil-A began a limited-time test of new breakfast entrées here in the Inland Empire. It’s a continuation of a trial that began last fall. Egg White Chicken Grill (300 calories, 6 grams of fat): Grilled chicken, egg whites and American cheese sandwiched in a toasted multigrain English muffin. Greek Yogurt Parfait (110 calories, 2.5 grams of fat): Honey vanilla Greek yogurt with blueberries and sliced strawberries, topped with a choice of granola or chocolate cookie crumbs. Multigrain Oatmeal (140 calories, 3 grams of fat): Steel-cut multigrain oatmeal, slow-cooked in a kettle. It’s supplemented with flax, whole wheat and buckwheat, then topped with blueberries and strawberry slices. It’s also served with a side of cinnamon brown sugar. Another sandwich chain is landing in the Inland Empire. Jimmy John’s, which has locations in 40 states (and a half-dozen in Los Angeles and Orange counties), is set to open a new shop Tuesday (August 26) in Fontana. The new location is at 16155 Sierra Lakes Parkway, Suite 110, formerly a Quiznos. 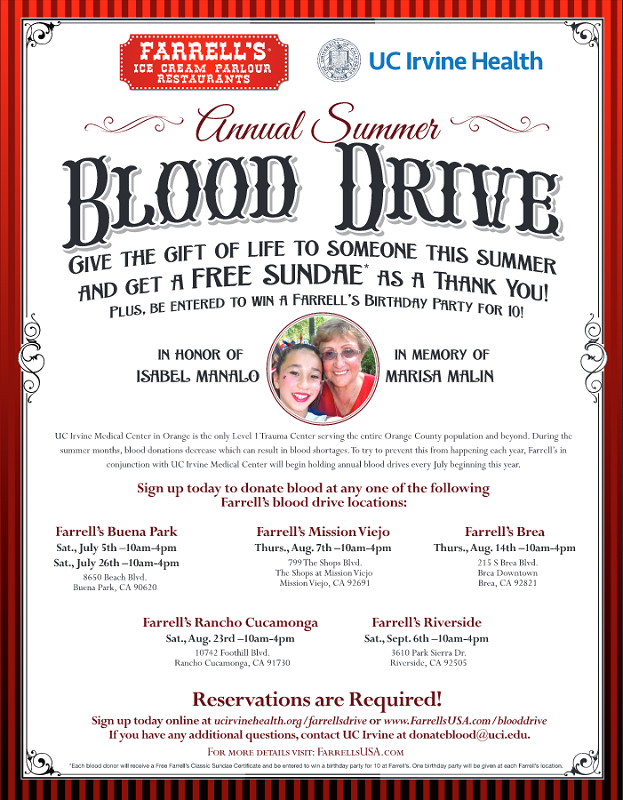 Another location is in progress in La Verne at 2320 Foothill Blvd., Suite C.
Farrell’s Ice Cream Parlour is hosting a blood drive from 10 a.m. to 4 p.m. Saturday (August 23) at its Rancho Cucamonga location, 10742 E. Foothill Blvd. 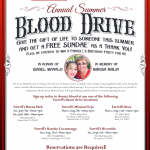 Donors receive a free sundae, and will be entered into a drawing for a Farrell’s birthday party for a group of 10. Heck, that’s way better than orange juice and cookies! 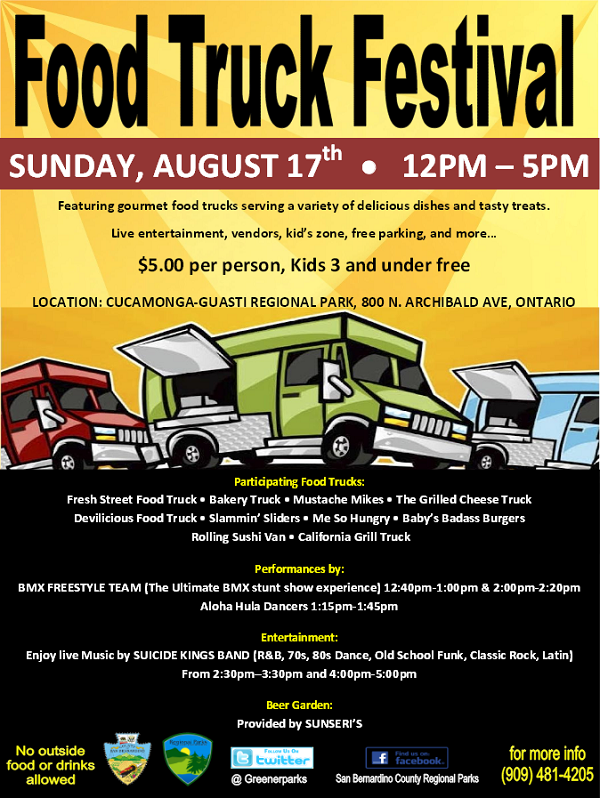 Food truck fans will want to roll over to Colony High School in Ontario Saturday evening (August 23). The school and its PTSA are hosting a food truck festival from 5 to 9 p.m. at 3850 E. Riverside Drive. 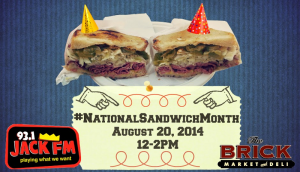 The folks at The Brick Market and Deli in Pomona are hosting a National Sandwich Month celebration from noon to 2 p.m.today (August 20). There will be giveaways from Jack FM and the first 20 guests will receive a coupon for a free chicken shawarma sandwich on their next visit. 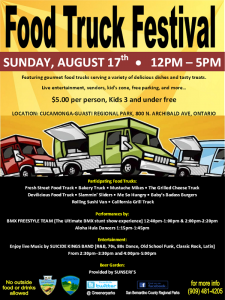 Food truck fans should make tracks for the Cucamonga-Guasti Regional Park, 800 N. Archibald Ave., Ontario, on Sunday (August 17). Scheduled trucks include the Grilled Cheese Truck, the Fresh Street Food Truck, the California Grill Truck, Me So Hungry, Baby’s Badass Burgers, Slammin’ Sliders, Rolling Sushi Van, Devilicious, Mustache Mike’s and the Bakery Truck. The event, which will feature live music from the Suicide Kings, plus BMX and hula demonstrations, is scheduled for noon to 5 p.m.
Tickets are $5 per person. Children age 3 and younger are admitted free. Philly’s Best Cheesesteaks’ San Dimas location is celebrating its ninth anniversary this weekend. In addition to $5 sandwiches and other $5 deals — plus giveaways — through Sunday (August 17), the shop is hosting a cheesesteak eating contest at 3 p.m. today. Prospective contestants must call the store at 909-305-8811. The entry fee is $20, and all paid contestants will receive a special edition T-shirt. Philly’s Best is at 806-C W. Arrow Highway. Dairy Queen’s Miracle Treat Day is tomorrow (August 14). For every Blizzard purchased at participating locations tomorrow, Dairy Queen will donate $1 or more to local Children’s Miracle Network Hospitals to help kids in need. This year marks the 30th year of Dairy Queen’s partnership with Children’s Miracle Network Hospitals. The chain has raised $100 million in support of the organization. Participating Inland Empire locations include Rancho Cucamonga, Redlands, Colton, Rialto, Yucaipa, Montclair, Bloomington, Riverside, Moreno Valley, Norco, Lake Elsinore, Temecula, Anza, Palm Springs, Bermuda Dunes, Ludlow and Baker. Tickets are still available for tonight’s (August 13) Incredible Edibles fundraiser for the Scheu Family YMCA of Upland. The event will take place from 6 to 8:30 p.m. at Memorial Park, 1100 E. Foothill Blvd., adjacent to the YMCA. Forty vendors are scheduled to serve, including Buckboard BBQ, Dale Bros. Brewery, Elvira’s Mexican Grill, Fleming’s Prime Steakhouse and Wine Bar, Graber Olive House, Hamilton Family Brewery, Hangar 24 Craft Brewery, Pacific Wine Merchants, Paul Martin’s American Grill, P.F. Chang’s, Pine Haven Cafe and Catering, Rök House Brewing Company, The Rustic Loaf, Souvlla Greek Grill, Vince’s Spaghetti and Vom Fass.